Radicchio, endive, chicory & escarole. General. Chicory is a perennial, but usually grown as an annual. Radicchio are a type of chicory. Endives are annuals. Both are closely related and one is often called the other. Escarole is a type of endive. Most chicory forms some sort of head and most endives are loose leaf, but not always. All grow best in cool weather and are normally grown in spring (from transplants) or fall (direct seed or transplants). Like lettuce, color deepens as it becomes cooler. 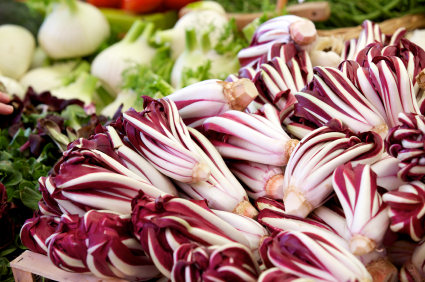 The beautiful brilliant red/white radicchio like Treviso, Palla Rossa, or Rossa di Verona are often ‘forced’. Forcing means in the fall you dig up the plant, cut off the head, cut the root back to 10-12 inches and replant it in a pot, usually filled with peat moss. Cover it with a pail, black plastic, etc. to keep out light and let it regrow at 50-60 degrees (a basement works well). In two weeks or so, you will have new growth which is bitter/sweet and has that beautiful contrasting color of white stems and red leaves. Of course, you do not have to force your chicory. Just grow it and enjoy it. Or you can have your cake and eat it too; dig it up, cut off the head and eat it, then bring it inside and force it. Endives, including escarole, are often ‘blanched’ to lighten color and change the taste somewhat. It is fairly simple to do. Seven to 14 days before harvest, withhold light from the plant. You can do this by putting a pail or pot or plastic bag over the plant or you can tie up the leaves with string. If you do this, make sure the leaves are dry and you untie it if the leaves get wet. Culture. All prefer soil conditions similar to lettuce: loose, well-drained soil with a higher than average fertility, especially nitrogen. In the north, spring crops can usually be grown with 4-6 week transplants set out four weeks or so before the last frost date. For fall crops, direct seed or set out transplants in July or very early August. Escarole and endive can go out a bit later. Direct seed 3-4 seeds every 12-16 inches in rows 16” apart. Set transplants at same depth they were growing. Provide a constant source of water. All of these will take very low temperatures and survive temperatures in the low 20s. Looseleaf varieties will survive the winter if given some protection or grown in an unheated greenhouse. In warmer areas (parts of zone 6, 7, 8, etc. ), you can leave them in the ground all winter. If your climate is warm enough, you can even ‘force’ them outside. Since chicory is a perennial, they will regrow the following spring. However, quality is not as good as those grown as annuals. Diseases and pests. Nothing much bothers these. You might have some problems with wire worms or root maggots in the early spring, but these can be controlled by using paper collars. Harvest, storage and use. Force or blanch as described above if you want. Cut, rinse & store in the crisper, preferably in a plastic bag. Don’t just use them in salads. You can quarter them (leave the stem so they don’t fall apart), dip in egg and breadcrumbs, and fry in olive oil. Escarole with beans is an excellent winter meal.